Special Offers from Discount School Supply®! : Available ONLY at Discount School Supply! There are a lot of reasons to shop Discount School Supply for your early childhood learning needs: Discount School Supply's 110% Lowest Price Guarantee, FREE shipping on in-stock orders over $79 and FAST delivery just to name a few. But one of the most compelling reasons to shop Discount School Supply is that Discount School Supply sells hundreds of products that you simply won't find anywhere else. For example, you will only find BioColor® Paint at Discount School Supply. BioColor® Paint is so versatile, you'll think it's magic! Use BioColor® with brushes, spatulas or other Discount School Supply paint accessories. It spreads and adheres easily to paper, plastic, wood, metal, cardboard and it shines brilliantly when dry. Best of all, it won't crack or fade with age! Use for fabric painting, sticker art, marbling projects, multi-colored putty, resist art, slick surface painting, scraper art, "paintsicles", blotter art and more! 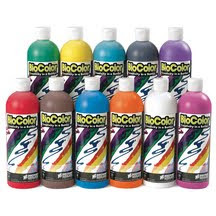 Get BioColor® Paint, 16 oz. for ONLY $2.99! 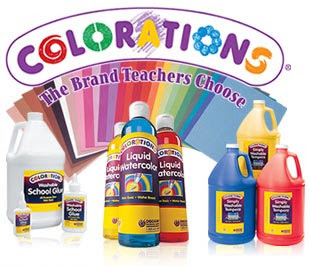 Another customer favorite and Discount School Supply exclusive is our line of Colorations® products. The Colorations® line includes markers, crayons, chalk, colored pencils , water colors, glue sticks, paint, dough and more. Customers love the price of the Colorations® line and they come back for the quality! 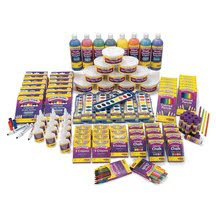 Get a Mega Ultimate Colorations® Classroom Starter Kit with 12 boxes of markers, 12 boxes of crayons, 12 boxes of chalk, 12 boxes of colored pencils, 8 bottles of paint, 12 glue sticks, 10 tubs of dough and more for ONLY $99.99! Only at Discount School Supply! But Arts and Crafts is not the only product category where Discount School Supply offers exclusive products. 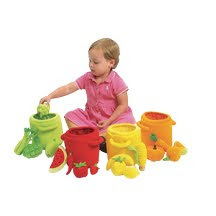 Get the Fruit & Vegetable Sorting Set - 20 pieces only at Discount School Supply. This vibrant set, for ONLY $38.85, includes 20 plush fruits and vegetables that make an amazing eye-catching set. Machine washable too! Or how about some block play items for the littlest ones? The Big Bright Baby Bricks - Set of 10 is only available at Discount School Supply! For ONLY $32.99, these soft big bricks feature colorful combinations with stimulating patterns. Blocks are lightweight and made with a soft spongy core under a colorful velour surface. Teachers, moms, dads and caregivers: want more products that you can only find at Discount School Supply? Then shop here and find Arts and Crafts, Active Play items, Dramatic Play products, Furniture, Curriculum Supplements, Manipulatives and more available exclusively at Discount School Supply. Great prices, free delivery, fast shipping: sure, those are all powerful reasons to shop Discount School Supply. But maybe the most compelling reason to shop Discount School Supply is simply because we have hundreds of products that you cannot find anywhere else! Click here for more!